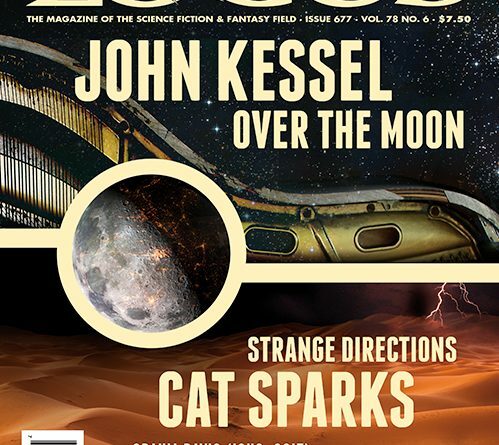 The June issue features interviews with John Kessel and Cat Sparks, a column by Kameron Hurley, spotlights on Scott H. Andrews and Heather Shaw, lists of forthcoming books through March 2018, and reviews of short fiction and books by Daryl Gregory, Dave Duncan, C.J. Cherryh, Ellen Datlow, Cory Doctorow, and many others. F&SF 1-2/17, 3-4/17; Tor.com 1/4/17, 1/18/17, 1/25/17, 2/8/17, 2/15/17. 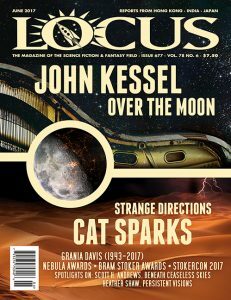 Asimov’s 5-6/17; Tor.com 3/17, 4/17; Lightspeed 5/17; Interzone 3-4/17; Beneath Ceaseless Skies 4/13/17, 4/27/17; In Search of Lost Time, Karen Heuler; The Djinn Falls in Love, Mahvesh Murad & Jared Shurin, eds. Spoonbenders, Daryl Gregory; The Strange Case of the Alchemist’s Daughter, Theodora Goss; Amatka, Karin Tidbeck; The Asylum of Dr. Caligari, James Morrow; Mightier than the Sword, K.J. Parker. Portal of a Thousand Worlds, Dave Duncan; Smoke Paper Mirrors, Anna Tambour; Spoonbenders, Daryl Gregory; The Possessions, Sara Flannery Murphy. Convergence, C.J. Cherryh; Infinity Engine, Neal Asher. Black Feathers: Dark Avian Tales, Ellen Datlow, ed. ; Behold the Void, Philip Fracassi. The Refrigerator Monologues, Catherynne M. Valente; Practical Applications for Multiverse Theory, Nick Scott & Noa Gavin; All Systems Red, Martha Wells; Arabella and the Battle of Venus, David D. Levine; We Are Legion (We Are Bob), Dennis E. Taylor. Down Among the Sticks and Bones, Seanan McGuire; Off Rock, Kieran Shea; Raven Stratagem, Yoon Ha Lee. Walkaway, Cory Doctorow; The Dark Days Pact, Alison Goodman; Red Snow, Ian R. MacLeod.